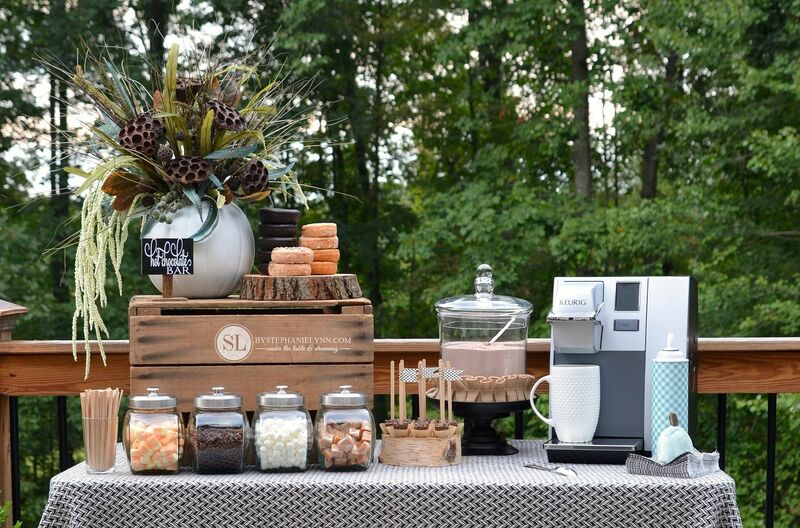 Hot Chocolate Bar | fall entertaining #michaelsmakers – As the outdoor temperature drops and the cooler weather rolls in I begin to think of all things warm, comforting and cozy. I just love this time of year and everything fall has to offer. 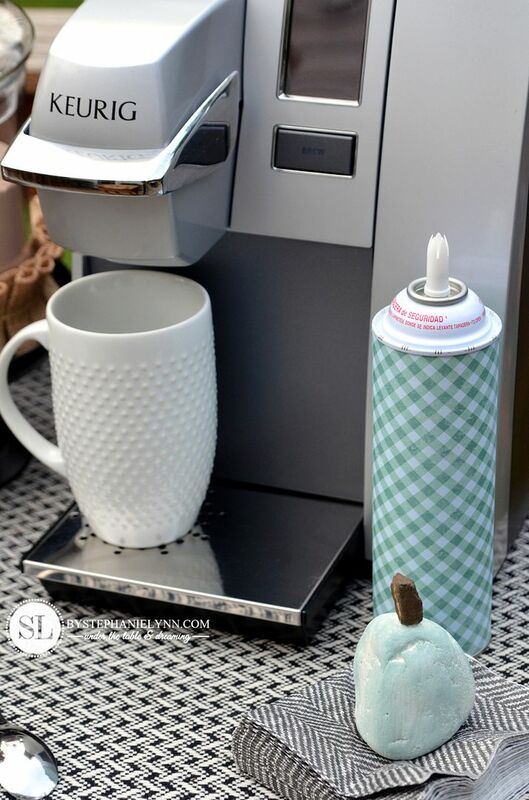 There are lots of fun, festive activities to enjoy outside during the autumn season – and of course the chill in the air requires one of our favorite fall essentials – hot chocolate. 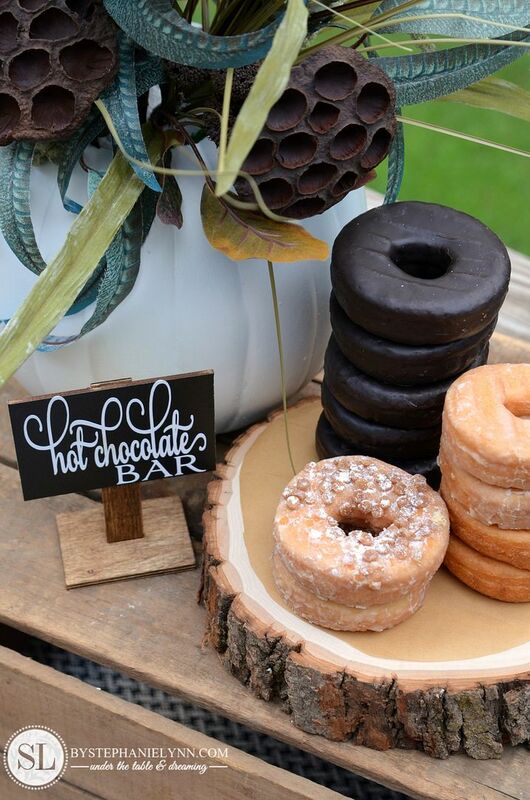 As a member of the Michaels Makers Blogging Team our theme for September is centered around all things Fall – so I decided to touch on some fall entertaining and create a Hot Chocolate Bar for an upcoming event we have planned. 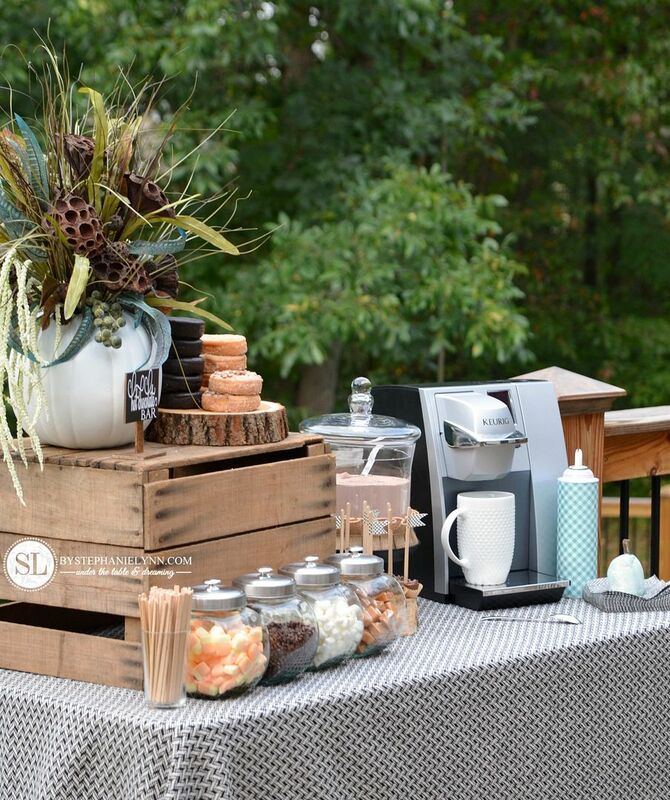 I love setting up self-serve bars for parties – once the prep work is done the tables run practically maintenance free – leaving the host more time to mingle and joy the festivities. 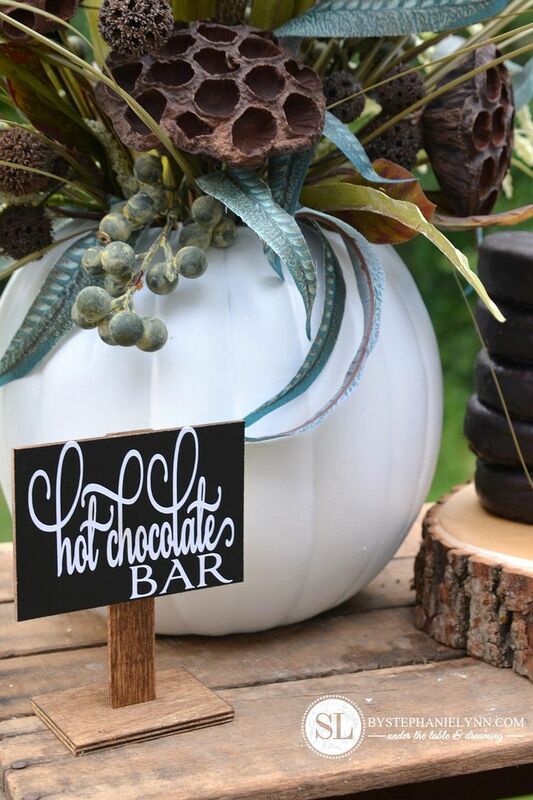 I thought this hot chocolate bar would be a nice touch this time of year to warm up our guests just a bit. All of the storage containers, serving pieces and decor for the bar were found right at my local Michaels. Those pieces are highlighted below. The pumpkin arrangement was the first thing I put together for the table. This was incredibly easy to create using a craft pumpkin from the Celebrate It line. I simply cut the top of the pumpkin off with a serrated knife and tucked in two pre-assembled faux flower stems from the floral department. I like buying floral stems that are already bundled together because the hard work of coordinating the variety of flowers is already done for you. The only two pieces I added to the arrangement are the flowing white stems seen on the left. The small standing chalkboard sign is from the new Raw Bar line. I stained the wood to darken it up a bit and used my Silhouette to cut the vinyl – as my handwriting skills are not as fancy. 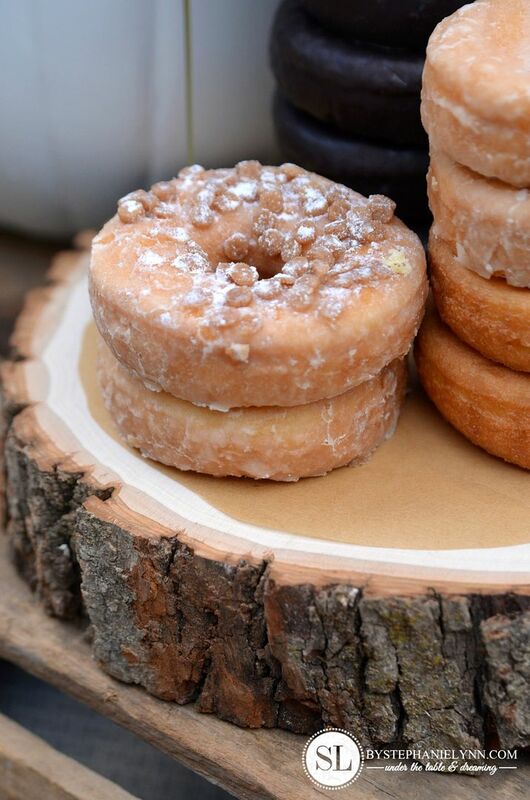 The platter for the doughnuts is simply a Walnut Hollow® Basswood Country Round®. I love the rustic look of these natural wood pieces and they make great displays. To help protect the wood – and food – I lined the wood slice with a piece of parchment paper. 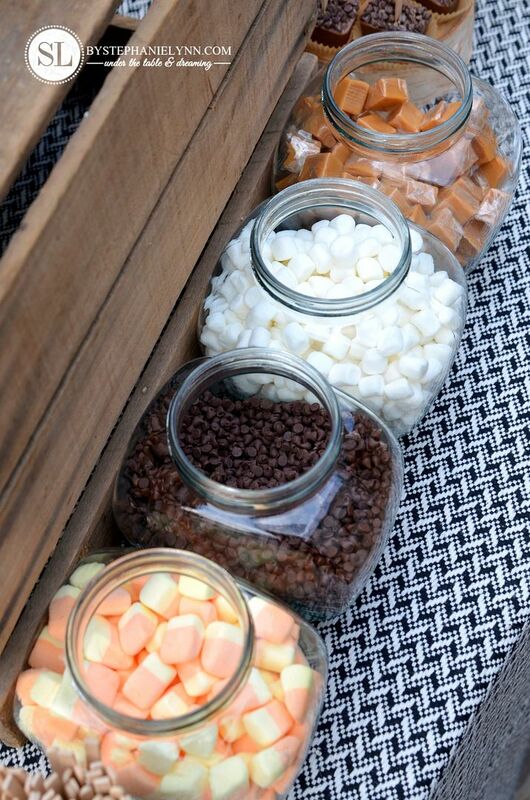 I thought these glass penny jars were perfect to display all of the Hot Chocolate Bar toppings. 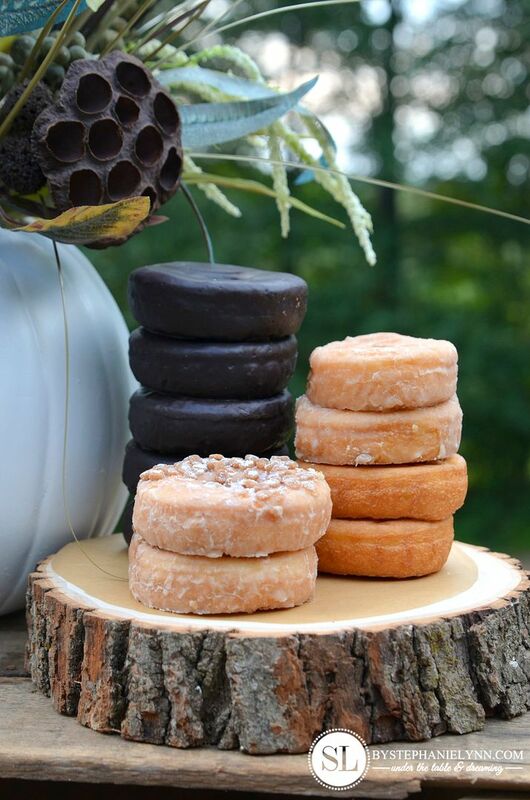 They were just $2 a piece and so versatile for entertaining. The lids come in variety of colors and I can’t help but pick up a few each time I go into the store. 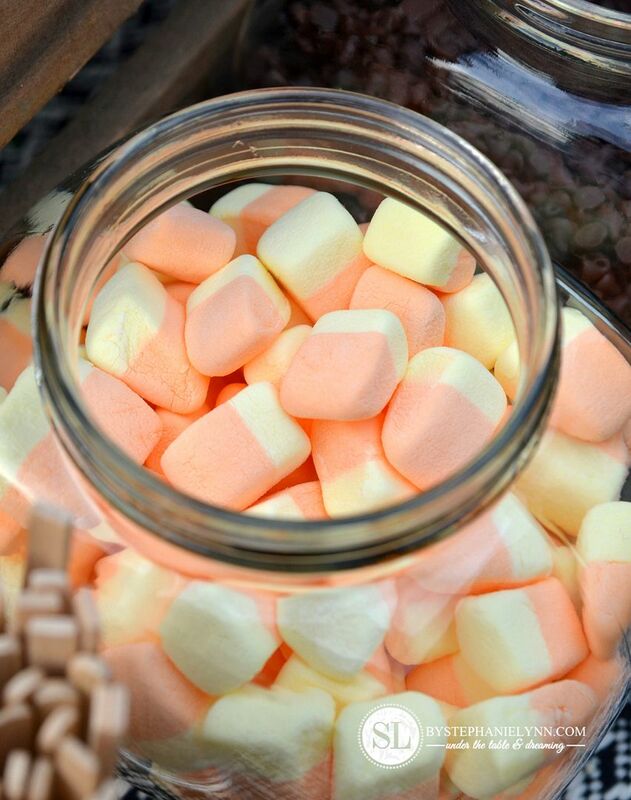 This time around we filled the jars with candy corn marshmallows, mini chocolate chips, mini marshmallows, and caramels. For the Hot Chocolate I picked up this Ashland® Glass Apothecary Jar. Glass jars and containers are some of my favorite things to have on hand for entertaining displays and I can never seem to have enough. 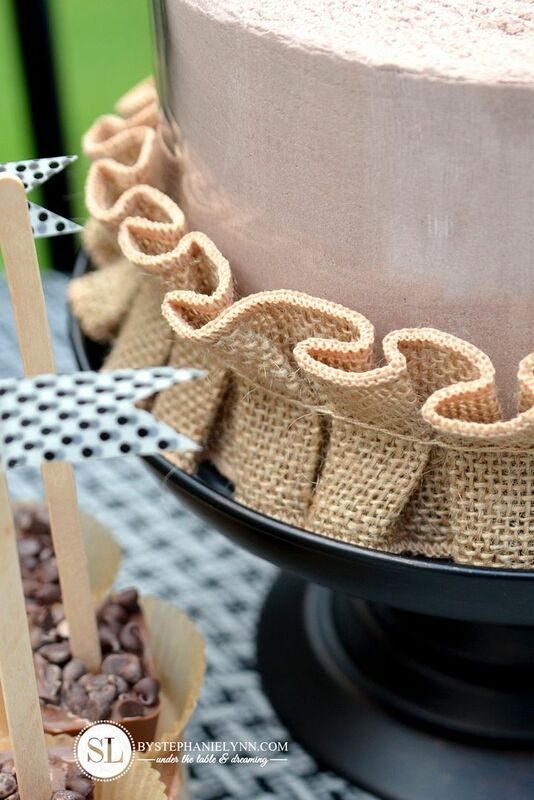 I sat the jar onto a pedestal to add some height and wrapped the bottom with a strand of Recollections™ Burlap Ribbon. The ribbon was found in the scrapbooking section and already comes ruffled. For our chocolate loving guests I made a few handmade chocolate stirrers. 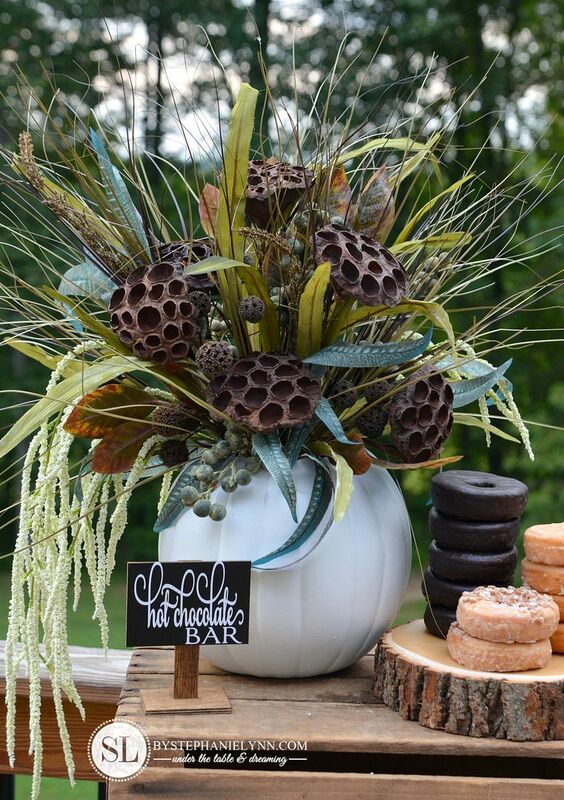 These were display on an ArtMinds™ Birch Pillar to keep with our rustic theme. 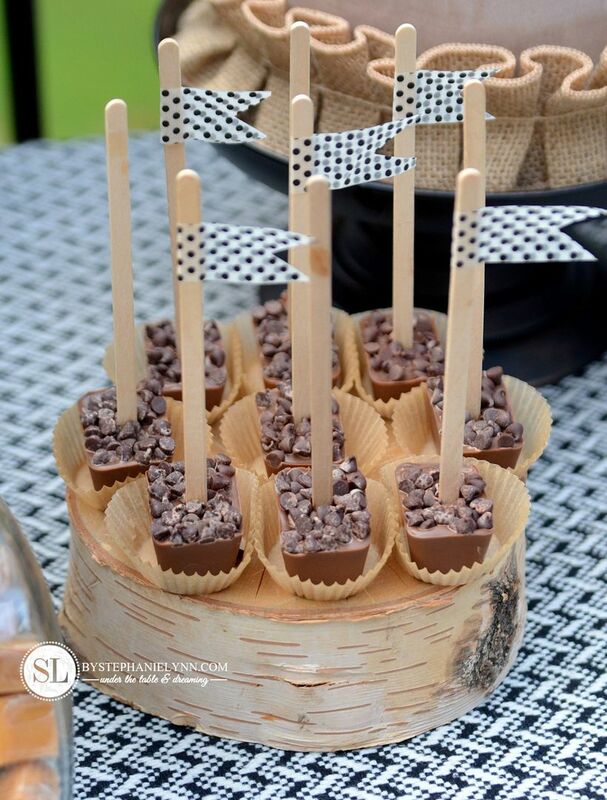 The chocolate stirrers were made with Wilton® Chocolate Candy Melts found in the candy section. I simply filled an ice cube tray with the wafers and microwaved it at 30 second intervals, until the chocolate was smooth and melted. 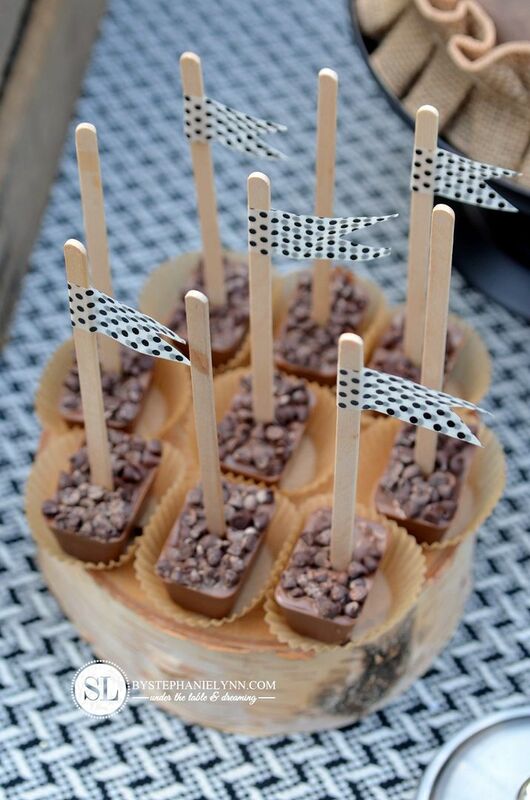 Once the chocolate set, I stuck in Creatology™ Wood Skinny Sticks, sprinkled on some mini chocolate chips, and placed the tray in the freezer. Once the chocolate hardens they pop right out of tray. 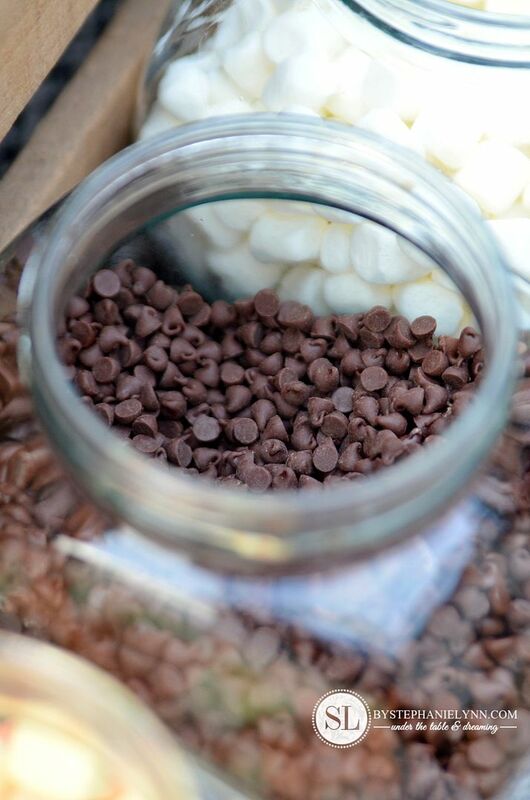 Note: if you are planning to have chocolate outside and it warms up in the sun – the chocolate may start to ‘gray’ or ‘whiten’. 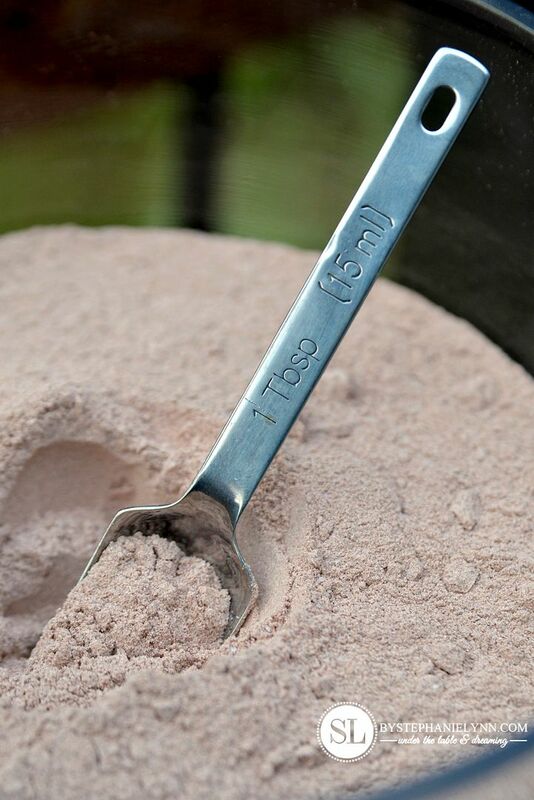 This color change is only caused by surface moisture on the chocolate which causes the sugar to dissolve. Recollections™ Washi Tape was used to add little decorative flags to the sticks…. and the extra stick were stuck in a glass to use as plain stirrers. For a constant supply of hot water I used our Keurig. 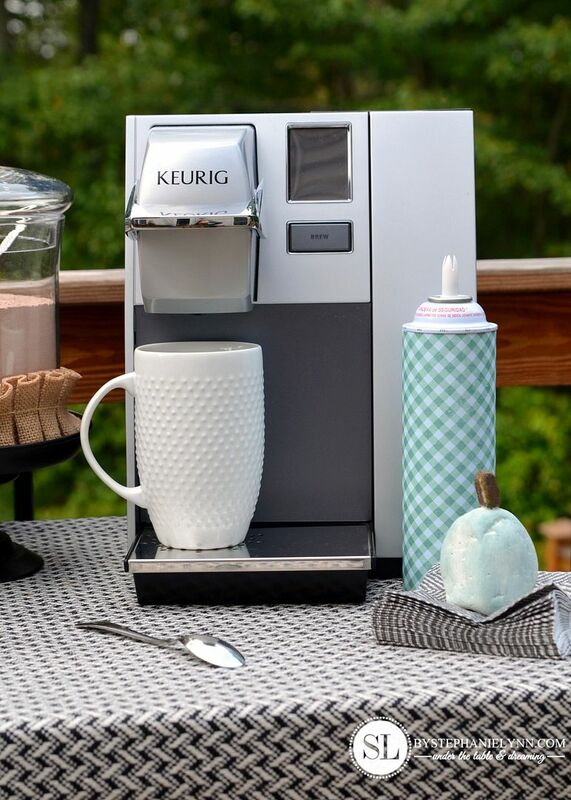 The hot chocolate mix is just tossed right into a cup and the Keurig is ran through a cycle without the k-cup – so the only thing coming out is hot water. It’s quick and super simple … and perfect for a crowd. Prior to the party it’s a good idea to make a note of the cup sizes being used and the amount of chocolate mix that should added. Be sure to display these numbers somewhere on the table for your guests. 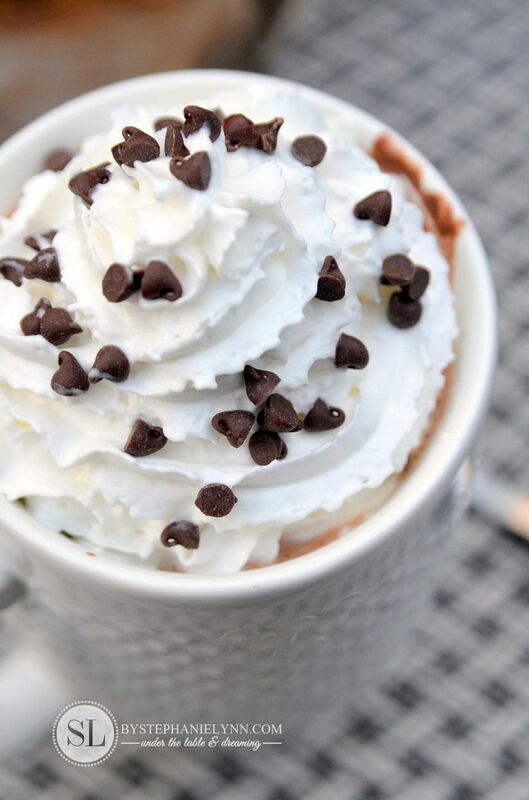 Of course every Hot Chocolate Bar needs a can of whipped cream. I prettied up the can by wrapping it with a piece of decorative scrapbook paper. I put another one of our Painted Rock Pumpkins to good use as a napkin holder too. I’m ready for sweaters, jeans, falling leaves, crisp air and hot cocoa. Absolutely terrific idea and so well displayed! Love it! I love this so much! You always have the best ideas!!! I can feel the burn on my tongue already! 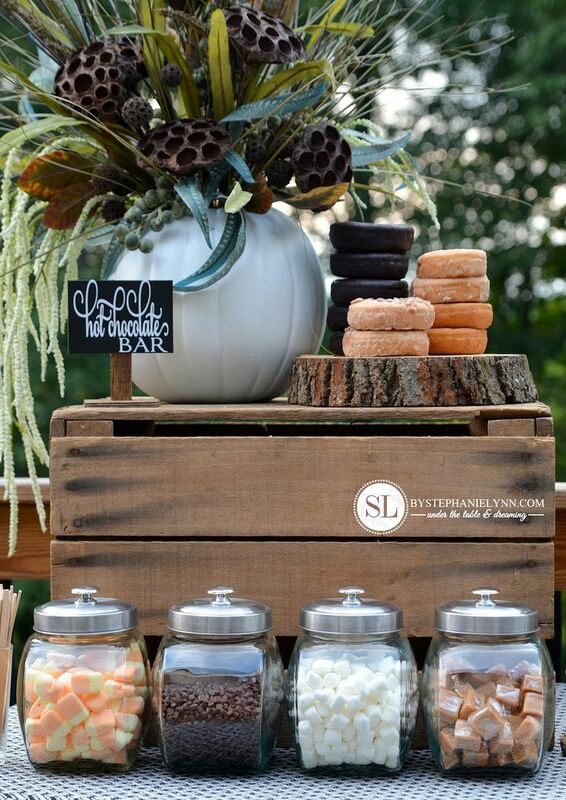 I love this idea and may have to plan a function just so I can make this bar. Thanks for sharing. Wow, this a gorgeous display! You are so creative. This is beautiful and works well for this time of year. Great idea…I am going to use this idea for our Women event at our church in October. 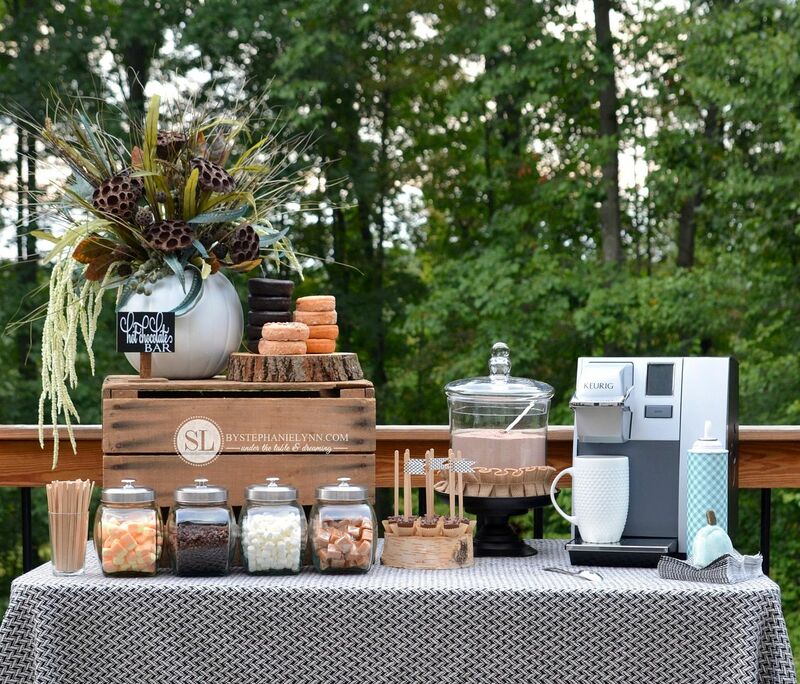 I have done a coffee bar before but this is super cute. 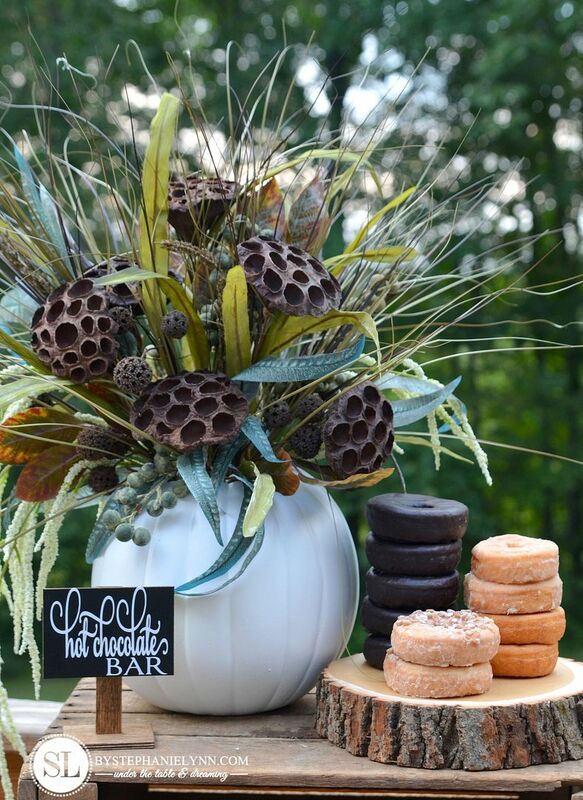 I hosted a party with a hot chocolate bar a few years ago, but I love your take on it. 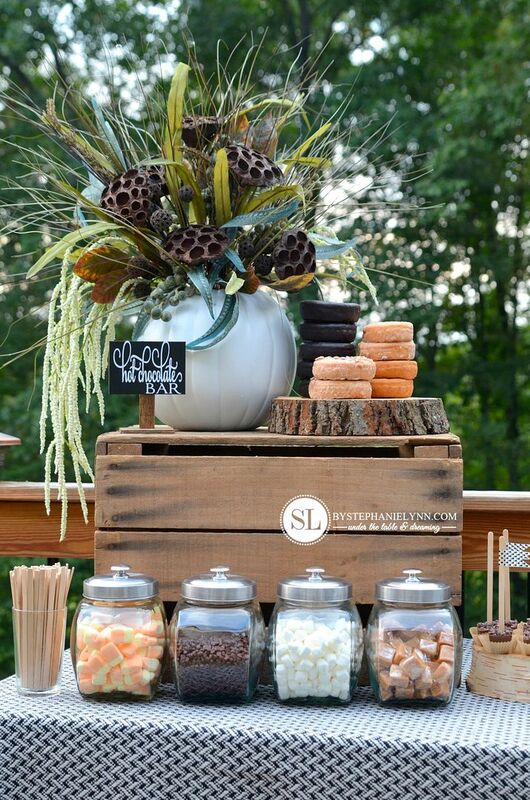 Your entertaining ideas always look amazing. 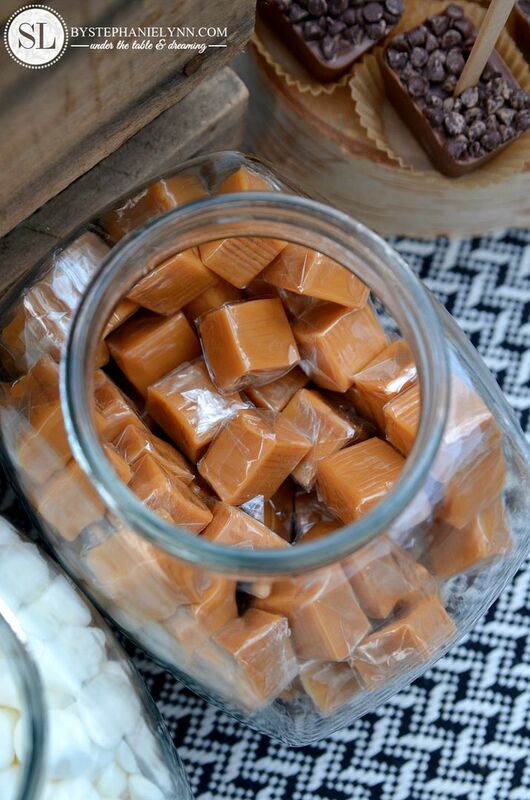 I need to pick up a few of those penny candy glass jars. Yum!! That looks like a fun party! You are so talented! Love everything!! Love the display and what a great idea – I cam going to use something similar at our Christmas open house as an added choice of beverage for people. 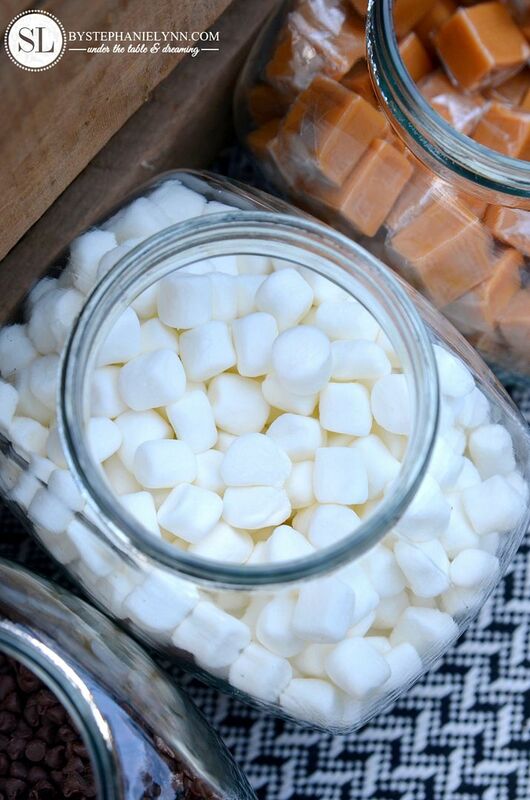 Were the glass jars that you said cost $2.00 – were they from Michaels as well. Thanks for sharing so many wonderful ideas with us. Hi Karen – Thanks so much! The glass jars are from Michaels. They are regular $5 a piece but have been on sale the past couple of weeks at $2 a piece. In my local stores they are in with aisles with the seasonal decor…some of them have them in the same aisle as the dollar spot items. Lovely and so creative – I love this idea! 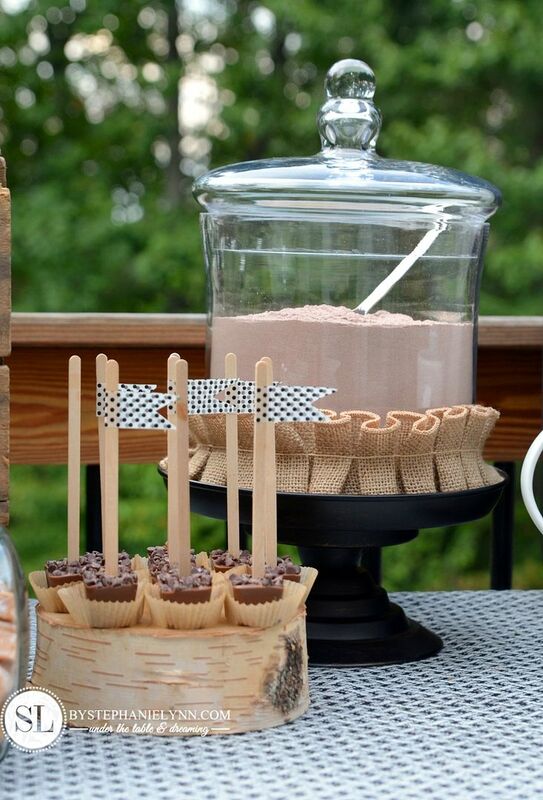 I love all the small details for the hot chocolate bar. Very creative, to cover up the cool whip container. I bet your guest enjoyed it the bar.